Meet talented Italian designer Alessandro Trincone, the winner of the FASHIONCLASH Festival 2016 Talent Award. Alessandro graduated with with honors from POLIMODA International Institute. His graduation collection Kings and Queens, was selected to be the best of POLIMODA’s graduation class of 2015. Following he took a scholarship at “Osaka Bunka Fashion College” in Japan. From then on, the Japanese culture has been a huge source of inspiration for his designs. This is shown in his new collection: 'Annodami', which talks about his own experience with oppression and self fulfillment. When did you realise you wanted to be a fashion designer? How long have you been designing clothing? I am designing clothes from 4 years and I realize that I wanted to be a fashion designer at an age of only 18. I said “ok, let’s try it” and then I understood that this way was my right way, my world, my dream and my passion. What are your main achievements in your career at this moment? Right now I am trying to find some internships to grow more as a person and to learn more. You can express yourself through fashion. Who are your artistic influences or inspirations and why? Thom Browne, because he likes to play with menswear, just like I do. What do you want to communicate with your designs in general? With my designs I want to communicate that everyone has to express themselves and has to be themselves. No scare, no discrimination, nothing. We are all the same thing. 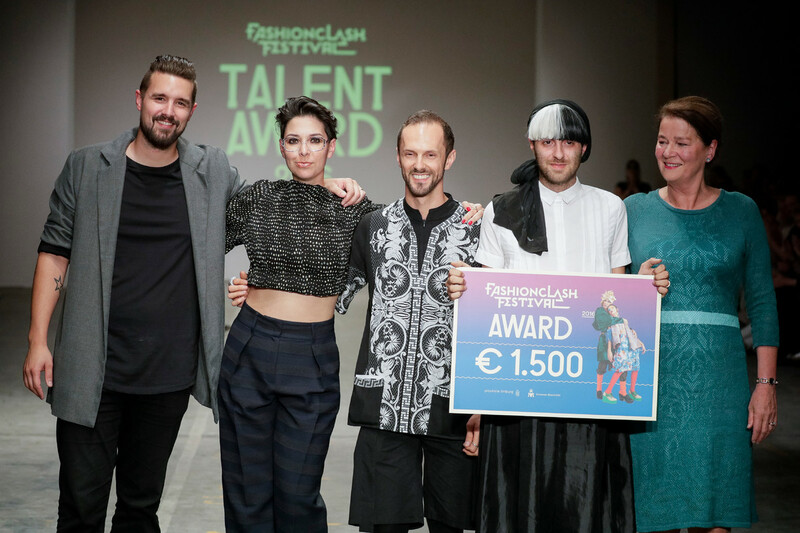 What is you collection you presented at the FASHIONCLASH Festival about? “Annodami” talks about my own experience with oppression and self fulfillment. Being raised in a socially rough environment, it has always been a challenging issue to express myself; I have gradually understood the importance of loving yourself as it is the only real protection from “evilness”. I believe we are only able to stand against fear with a crystal clear reflection of our inner selves . The visual translation of this idea is mainly connected to Japan and its iconography, such as the Ban Gasa, sushi and the Japanese flag. Through the study of the Kosode trousers and traditional kimonos I built a bridge between my Napolitan sartorial heritage and the Nippon culture, a culture clash expressed through overly draped garments, very tight waists, knots and bows. The emphasis on the waist expresses my idea of protection, redefining tightness as a synonym of strength. The androgynous identity of my inspirational garments reinforces my belief of no-gender boundaries between men and women. The feminine side of every male is explicitly shown through the whole col- lection, hoping to introduce a new meaning of masculinity, far from the traditional imagery society has carried through time.